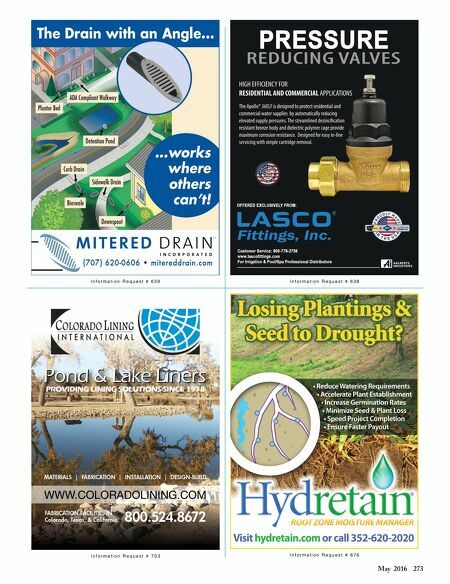 272 Landscape Architect and Specifier News 2016 Specifier's Guide water management Irrigation / Rotors Irrigation / Spray Heads Irrigation / Subsurface Irrigation / Low Volume See Ads on pages 265, 275 Information Request # 9046 The Toro Company 877-345-8676 toro.com Designed to use the slip clutch to make arc adjustments the Toro® T5 RapidSet rotor can be set in seconds - NO TOOLS are required. With a five inch pop-up height, the T5 RapidSet rotor includes Airfoil™ Technology nozzles for no superior uniformity. Stainless steel riser option now available. The Toro Company See Ads on pages 265, 275 Information Request # 9223 Toro's T7 Series rotor is built to endure the requirements of municipal, sports and commercial settings. Designed and tested to ensure consistent performance, the T7 rotor features a 5" pop-up height, a top-of-rotor arc indicator. 877-345-8676 toro.com Irritrol See Ads on pages 267, 275 Information Request # 9322 Irritrol's I-PRO™ Series spray heads combine a pressure-activated wiper seal, advanced formula lubricant that virtually eliminates stick ups, and a unique tapered lip to stop debris from entering for a spray head with superior performance. 951-688-9221 irritrol.com See Ads on pages 269, 275 Information Request # 9018 Netafim USA 888-638-2346 netafimusa.com There is no doubt that drip irrigation saves time, money, and perhaps most importantly, water. Because water is applied directly to the root zone, there is no runoff or water lost to evaporation. 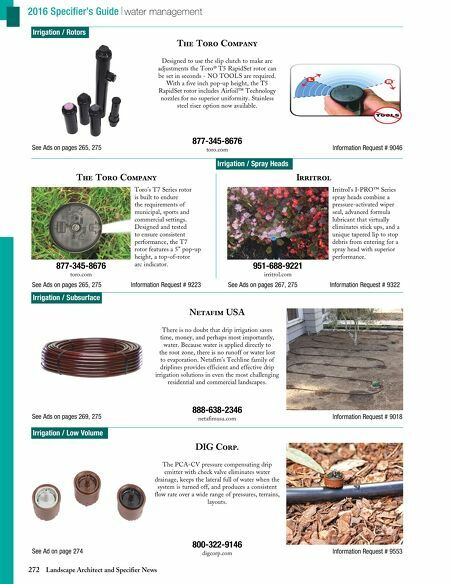 Netafim's Techline family of driplines provides efficient and effective drip irrigation solutions in even the most challenging residential and commercial landscapes. See Ad on page 274 Information Request # 9553 DIG Corp. 800-322-9146 digcorp.com The PCA-CV pressure compensating drip emitter with check valve eliminates water drainage, keeps the lateral full of water when the system is turned off, and produces a consistent flow rate over a wide range of pressures, terrains, layouts.